New Delhi: The government needs to bring out a policy on solar module waste management and standards for use of material for manufacturing, according to consultancy Bridge To India on Thursday. "There is an urgent need to formulate appropriate quality standards for use of environmentally sustainable materials in manufacturing of modules. This will help in minimising potentially hazardous end-of-life module waste in India," said a BTI statement. The European Union (EU) already has an Eco-Design Directive 2009, a policy instrument to reduce environmental impact of energy-related products throughout their life cycle, the statement added. 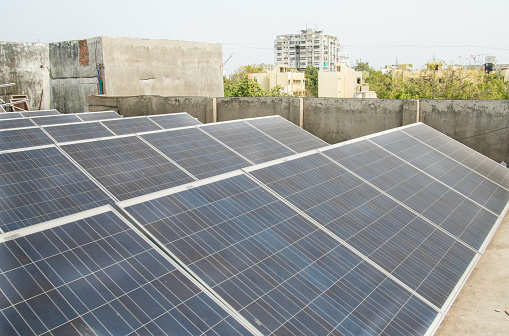 Bridge To India (BTI) Managing Director Vinay Rustagi said while the solar sector continues to grow robustly, from a mere three gigawatt (GW) in 2014 to over 28 GW currently, there is still no clarity on solar waste management in India. "To make solar a truly green source of energy, it is imperative for the industry as a whole to work together and proactively towards ensuring a sustainable waste management plan for solar energy systems," he said. India has set an ambitious target of having 100 GW of solar energy by 2022. BTI has estimated the solar module waste volume to grow to 1.8 million tonne by 2050, which is close to the total e-waste volume being annually generated in India currently. Currently, India neither has a requisite policy guideline nor the minimal operational infrastructure to ensure recycling of module waste using conventional recycling technologies. Most of the central bidding documents rest the responsibility of handling and disposing photo voltaic (PV) waste on the developers as per E-waste (Management and Handling) Rules, 2011. It said, "The e-waste rules make no mention of solar PV waste. Even the conventional recycling facilities for laminated glass and e-waste are unavailable in the country." Solar module recycling is still not commercially attractive. Cost of recycling is estimated to vary between USD 250 and USD 300 per tonne in Europe and the US. Transportation cost can add 60 to 100 per cent to this cost depending on distance. By comparison, the value of recovered materials is estimated to be only about USD 45-130 per tonne depending on the recycling technology used for crystalline silicon(c-Si) modules. Various attempts are being made, especially in the EU and the US, towards ensuring a higher recovery of raw materials in a cost-effective manner, it added.